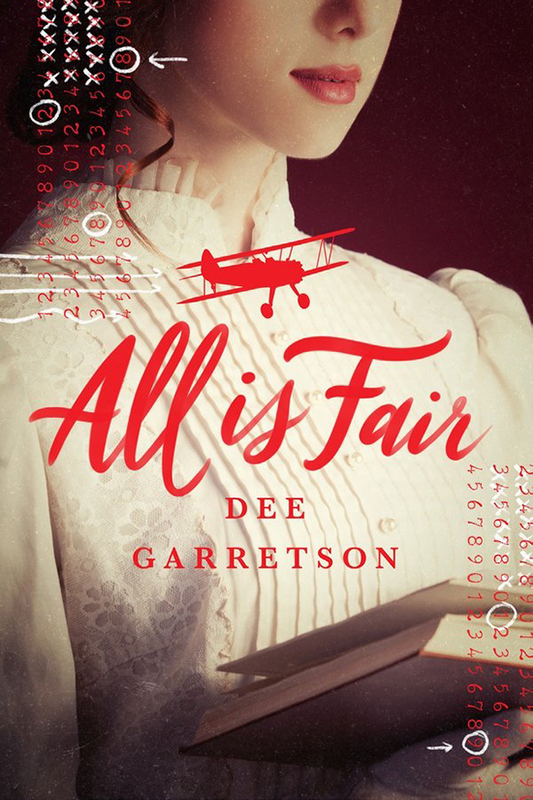 All is Fair released yesterday, and I am excited to host the author of the novel, Dee Garrestson, on the blog today! Let’s start off with a little bit about the book. What was your inspiration for All is Fair? I love history and had self-published a historical mystery set in 1878, The Gargoyle in the Seine,which I always intended to continue as a series but have not yet gotten around to that. Then I fell in love with “Downton Abbey” and started to ponder a story with a similar setting. One of the characters in the 1878 book was a spy for the British government and though he’d be far too old in 1918 to be a main character in a YA book, I came up with a life that could have happened to him after 1878. That’s how his youngest daughter, Mina, becomes the main character of this book, and why there are spying and code elements in it. It was so much fun to write and so much fun to imagine their whole family’s history in those intervening years. All is Fair is set in 1918, the last year of World War I. What kind of research was involved for this setting? When I’m writing historicals, I first immerse myself in the general history of the time period so I can get a better feel of how to focus. As I’m reading, I always find references to events that intrigue me, and I note those down and then delve into more specific research. When I first started researching All is Fair, I only knew the very broad outlines of the history. Stumbling on books about how the Belgian underground operated and the raid on Zeebrugge were like finding hidden treasures. I knew I had to incorporate both of those. After the structure of the story comes together, I focus on memoirs and autobiographies to get a sense of the smaller details of daily life. I do tend to get so immersed, I have to cut myself off at some point so I’ll actually write the story! I love spy stories so I can’t wait to read All is Fair. What are some of your favorite spy books and movies? I grew up in a small town with a small library so I read a lot of adult fiction growing up, and much of that was spy fiction by Frederick Forsythe, Ken Follette, and John Le Carre. I also particularly loved ASHENDEN: THE BRITISH AGENTby W. Somerset Maugham, especially when I found out the author had been a spy himself. It’s much less of a thriller-type book than the other later books, but I liked knowing it had so much authenticity to it. I don’t remember the names of all the classic WW2 spy movies I watched too, but I vividly remember watching reruns of the original Mission Impossible television series. I’ll give any spy movie a try. I think “The Hunt for Red October” is a terrific movie. The book is good too, though very different from the movie. How would your main characters Mina and Lucas describe each other? Part of the book centers on how Mina and Lucas view each other at the beginning and how that changes over the course of the book. It’s easy to make snap judgements of someone based on superficial things like clothes or even how people act when you first meet them. Mina thinks Lucas has too much confidence for his own good, and Lucas views Mina as a bit of a shallow rich girl. What song would you choose as a theme song for All is Fair? “Living in the Moment” by Jason Mraz could have been written by Lucas as summing up his view on life. As soon as I heard it, especially the whistling at the beginning, it just clicked. Living in the moment is a bit of a theme in the book. No one knows what the future will bring, so appreciate the moment you’re in. It’s how I’m trying to live my life these days. Is this the last we will see of Mina, or do you any have plans for a sequel? I have more of Mina’s life in my head, but I don’t know when or if there will be a sequel. I always like to know the next story in my characters’ lives when I finish a book. Let’s just say that wasn’t the last adventure she’s going to have. Dee writes contemporary, science fiction and historical adventure stories for a wide range of ages. Her books have been chosen as Junior Library Guild selections, the Scholastic Book Club, and have been nominated for numerous state awards lists. In addition to books published under her own name, she also writes for the Boxcar Children series. Be sure to check out the other stops on the ALL IS FAIR blog tour! Many thanks for the Q&A!